We deliver Toughooks Worldwide. To make sure you get the best deal in your local currency choose your preferred Toughook store from the list below. Our original Toughooks come in 4 sizes and 20 different colours - all of them guaranteed for life against breakages. The unique design makes them both safer than metal hooks and completely unbreakable (we even made a climbing wall out of them to prove it). You can mix and match sizes and colours however you want to get the perfect combination for your school, changing room or office. Available as 2, 4, and 6 hook lengths. 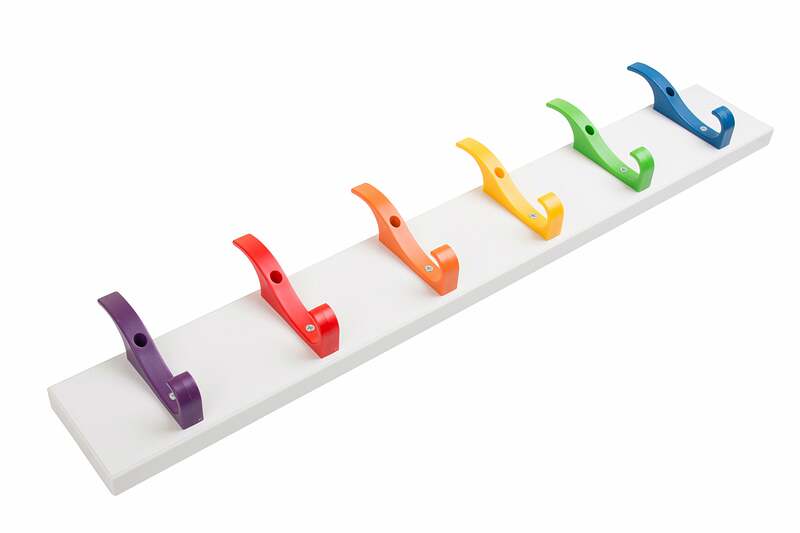 These ready made coat rails come with unbreakable plastic Toughooks or Toughook XL in your choice of twenty colours. Introducing our self-adhesive Toughook Stickies. Super strong and ideal for sticking anywhere you can't screw in a regular Toughook. Get 7 for just £3.15 + VAT. Choose from 12 colours or our classic mixed Rainbow Pack. We are a nursery and the fact that Toughooks are colourful, practical, versatile and durable is excellent and suits our needs exactly. The assortment of colours, bright and neutral, and variety of sizes suits many needs from the usual coat hooks to hanging bags, aprons and equipment. Introducing the newest Toughook, the Toughook XL. Made with our same eye-catching design but with even more space for hanging coats and more. The larger size makes the XL hook ideal for bulky items. Eagle-eyed viewers of ITV’s Emmerdale on 24th September might have spotted a familiar brand re-emerging on TV for the first time in 20 years. Alongside that Toughook made an appearance too! Despite a difficult time for some sectors of UK manufacturing Toughook continues to expand. Architects across the world are now specifying our hooks in their plans for school and public space refurbishments. Prices now include VAT throughout the cart and checkout process. EU customers with a valid VAT number will not pay VAT. If you are shopping from outside the EU please visit Toughook.com. Schools and businesses can see just how safe, strong and colourful Toughooks are with a sample pack delivered straight to your door. Just pay postage and get that back when you buy more! Stay up to date with the latest products, offers and updates. No spam ever! Safer. Stronger. Guaranteed for life. Are you in the UK? You can't buy from here, but we've got a UK shop. It looks like you aren't in the UK. USA and worldwide sales are handled by our USA store.